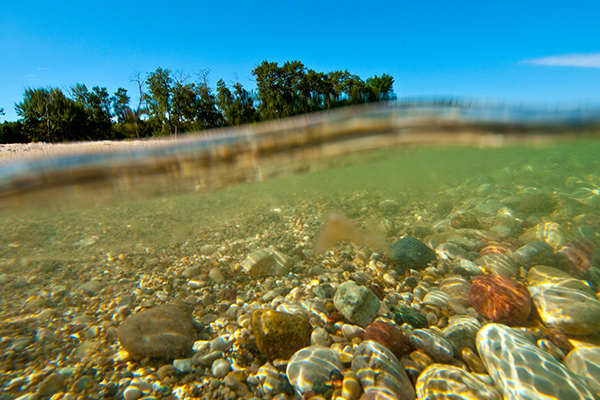 Water systems are failing in many Great Lakes communities. These aging systems were designed to capture the rainwater that falls on roofs, roads, and parking lots and send it as quickly as possible into the nearest storm drain. All that water is then sent cascading into the nearest Great Lake, river, or stream. Aging and outdated, the systems are overwhelmed by heavy storms. Neighborhoods flood. Polluted water pours into our waterways. And if we don’t make changes, things will only get worse. Our region is experiencing heavier and more frequent rains. Extreme weather will become even more common in the future due to climate change. Green infrastructure uses plants and soil to mimic how nature deals with water. It absorbs, slows down, and filters rainwater before the water reaches stormwater pipes or waterways. 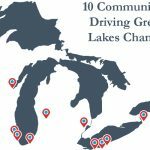 We begin by organizing a wide variety of community voices: residents, local businesses, community organizations, elected officials, city staff, technical specialists, and funders. They work together to imagine and build small pilot projects. 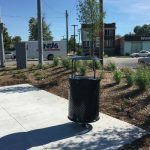 These projects provide community benefits like neighborhood beautification and the creation of parks and green spaces. 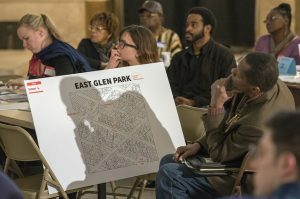 Next, we work with local leaders and community members to create a shared vision and a plan for work at a larger neighborhood scale. 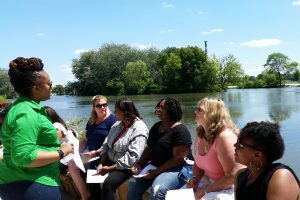 9 communities in 3 states have leveraged the plans to raise more than $16 million for water-related projects and programs. We also work with local governments to create cost-effective policies for building green infrastructure and guiding development. 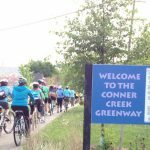 Detroit: Residents and community organizations are creating a new future for the Conner Creek Greenway. 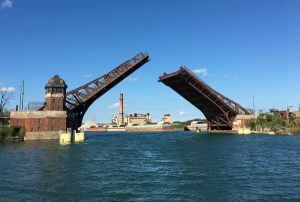 This 8.5 mile trail connects Eastside communities to the Detroit River, which flows into Lake Erie. Green infrastructure along the greenway can help reduce neighborhood flooding, create gardens, parks and picnic areas, and provide safer biking and walking pathways. We’re working with community members to choose sites and design demonstration projects that can start making their vision a reality. 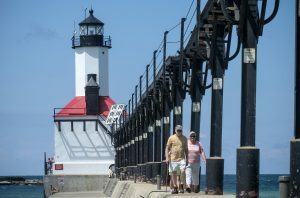 Michigan City, Indiana: The city and its residents rely on Trail Creek — which flows into Lake Michigan — for recreation, ecotourism, and the health and safety of the city’s renowned Washington Park beaches. We helped the city raise more than $1 million to restore wetlands along the creek. Now we’re organizing community members to help guide the wetlands’ design. This project will keep pollutants out of Trail Creek, provide fishing access points and improved fish habitat, and give students more opportunities to learn about their local environment. 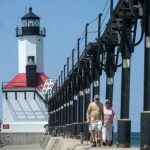 Southeast Chicago: The Southeast Side is home to several Lake Michigan beaches and the Calumet River, which flows into the lake. The river and nearby neighborhoods have suffered from a legacy of industrial pollution. 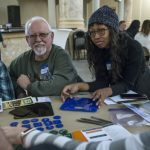 But community members have exciting ideas about how green industry, bike trails, community green spaces and a cleaner river could enhance their quality of life and attract people to their neighborhoods. We’re working with local community groups to create pop-up events that will inspire new thinking about the area, get more people involved in the conversation, and begin to spur long-term investment.